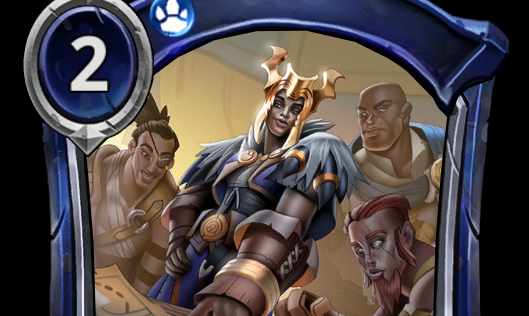 Evaluating Eternal: What level player are you? Hi everyone! It’s time for another Evaluating Eternal article. Today, the nature of my article is going to be slightly more narrow as I will be specifically targeting competitive play rather than constructed in general. 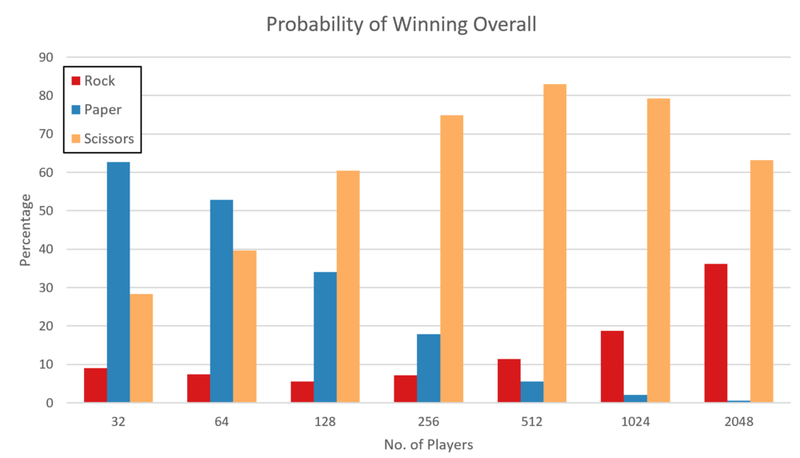 The idea for this article arose from a simple question: Assuming you are going to a tournament and through scouting/predictions, you’ve found out that 50% of the field is playing Rock, 25% of the field is playing Scissors and the last 25% of the field is playing Paper. What is the correct deck to bring? Well, as it turns out, the answer is non-trivial, and pretty counter-intuitive in some cases. More importantly, it not only depends on the tournament format, it also depends on what your objective is. To analyze this question, we first need to define our assumptions. The decks are named Rock, Paper, Scissors to reflect the nature of their relationship, the Rock deck will always beat the Scissors deck, and so on. Moreover, we assumed that outside of the constraints of the tournament format, there are no other restrictions, and no intentional draws are allowed. I will be specifically looking at the Swiss Format, and the Modified Swiss Format used for ETS Invitational Season 1. Other formats generally obey intuition to a T (e.g. Round Robin) or are heavily pre-determined by initial seeding (e.g. Single Elimination, Double Elimination). To generate the results, I simply ran a Monte Carlo simulation 1000 times for each scenerio, hence giving me a good estimate of what the true pattern is. To start things off, lets look at the most common tournament format, Swiss. For ease of calculations, I ran simulations with 2n players, so as to avoid awkward down-pairs. With 32 and 64 total players, the results pretty much line up with our intuition; if you bring the counter (Paper) to the most popular deck, you give yourself the highest chance of winning. But as the number of participants increase to 128 or higher, if you aim is to win, you should actually bring the counter (Scissors) to the counter, i.e. the deck that is actually unfavored against 50% of the field. Now this seems extremely counter-intuitive, and it gets even weirder if we look at the average win rate of the deck for different number of players. As our intuition expected, the win rate of decks doesn’t change much with players. Moreover, Scissors decks have the lowest win rate, as expected since it losses 50% of it’s games. So why does the chances of Scissors winning suddenly increase once the number of players increase? This is an interesting phenomenon that arises due to how Swiss matchmaking works. Imagine you are a Scissors deck. In the first few rounds, you managed to dodge the Rock decks and find yourself in the 3-0 bracket. Now, you look around, and you realize, the majority of decks in this bracket are Paper decks! Since a majority of the field is Rock decks, it’s only natural that Paper decks will do well at the start. But now, suddenly, in the 3-0 bracket, the majority of your “field” is now Paper decks, which is super favorable for you! However, of course the contrary can also happen. You could simply run into a Rock deck round 1, and end up facing an endless stream of Rock decks getting beaten by Paper decks and go a depressing 0-X. And that is why, despite having the highest chance to win in a 128+ participants tournament, Scissors decks still have the lowest win rate on average. Another interesting question that arises is, what if this is the last week of ETS before the invitational? Perhaps all you need to do is Top 8 and you make invitationals. Does that change things? Well, let’s see. I didn’t track opponent’s win rate (tiebreak for players with the same score), so instead, I decided to look at the number of decks that go X-1 or better. Interestingly, this tells us yet another story. With 256 or lesser players, you should bring the Paper deck. Any higher, you have a better chance of top 8ing with the Scissors deck. Again, this is an interesting property of the Swiss matchmaking, because decks become naturally segregated into different pools as the round progresses. Of course, no model is perfect, and perhaps the largest criticism of this model is assuming the counter deck wins 100% of the time. In reality, even the hardest counter has something like a 70% win rate only. So how does that change the odds of deck X winning? Well, now it looks like our intuition hasn’t failed us at all! Bringing the counter to the most popular deck gives you the largest chance of winning. It’s also important to highlight that bringing the Scissors deck is also still better than the Rock deck, if you want to win (Since there are twice as many Rock decks, your probability of winning with a rock deck is half of what is indicated in the graphs). This is also a very interesting point to note. If you want to win, you should avoid bringing the most popular deck at all cost! The number of decks that go X-1 or better also tell a similar story, albeit less damning for the Rock deck. Bringing the Paper deck is still your best chance of getting into the top 8. However, when there are less than 256 players, you still have a better shot of making top 8 with the most popular deck (although you are highly unlikely to win it). Now, how about modified swiss, the new format for invitationals? If you are unfamiliar with the format, it’s basically a way of cutting the field into half by using a Swiss format, but taking out any player that wins or losses more than X matches. Now, given this format, what deck gives you the best odds of making day 2? Now this creates an extremely interesting scenerio. Firstly, the distribution is basically unaffected by the number of players. Bringing the Paper deck also gives you a staggering 81% chance to make day 2, whereas bringing the Scissors deck is pretty close to a death sentence. Rock decks also have a 50-50 shot of making day 2, basically boiling down to whether they run into X paper decks or X scissors decks first. Paper and scissors decks are also being eliminated from the pool at similar rates (although one is from winning X matches, and the other from losing X matches), so the odds of getting through with a Rock deck remains unchanged. So, what does all these numbers tell us? Basically, don’t be too smart for your own good! Don’t try and next level the meta by bringing the counter to the counter deck. To maximize your odds of winning, or making top 8, you simply need to play the counter to the most popular deck. And game theory tells us just as much. In order to beat the level X player, the optimal strategy is to play at level X+1. Well, I hope all of you have enjoyed this random delving into match-up theorycrafting and crunching of random numbers! Special shoutout to Batteriez who sparked this debate on the Eternal discord and NotoriousGHP who discussed modifications to implement with me. As always, let me know what you think in the reddit thread!